It is nearly evening in the desert village of Adorihi in southern Niger, and 36-year-old Aisha Oumarou crouches over her cooking fire carefully mixing oil into a pot on coals. Although the mixture smells faintly of peanuts, the hot dough that Oumarou extracts from the pot and rolls between her hands is not destined to be the evening's meal, but balls of soap. Humble in its origins of water, ash, and peanut oil, Oumarou's homemade soap is a traditional Nigerien recipe that is helping prevent future blindness in an area ravaged by the bacterial eye disease, trachoma. Trachoma can be spread easily from person to person by eye-seeking flies that are attracted to dirty, watery eyes or by touching eyes with dirty fingers. Soap helps people keep their hands and faces clean, which can prevent the spread of the disease, especially in dry, dusty environments that cause eyes to water. In many trachoma-endemic areas around the world, soap is unavailable, but washing with water alone also reduces the spread of the disease. Niger's Zinder region, where Oumarou's village sits, is one of the most trachoma-endemic areas of the country. Repeated infections of the disease are common here and can lead to diminished vision and blindness, possibly even be a contributing factor to an early death. In many areas of Niger - a nation where most people live on less than US $1 a day - soap is often unaffordable (about 25 cents per bar). Expanding on efforts to reduce trachoma transmission in Niger, the Carter Center's Trachoma Control Program assists Nigerien health districts in teaching local women how to prepare soap. The hope is that these women will share their new skills with other women in the community, widening the impact of the program's efforts so additional households will have access to a more affordable soap. "When the health district was looking for women to be trained in traditional soap making using local ingredients, I volunteered immediately," said Oumarou. "I realized that the process is simple to learn. It's also easy because I have all of the ingredients at hand here in the village." Oumarou sells her homemade balls of soap for 50 CFA francs each (about 10 cents), a more affordable price than manufactured soap, in even the poorest of Zinder's villages. She can sell between US $4 and $8 worth of soap per week in her village, a considerable boost to her family's income. Since learning soap making, Oumarou has proudly shared the technique with 20 other women from her own village and neighboring villages. To date, The Carter Center, in partnership with the Niger Ministry of Health, has taught nearly 1,000 rural Nigerien women how to prepare traditional soap as part of an effort to prevent the spread of trachoma. Aisha Oumarou washes her daughter's face using soap she has made. 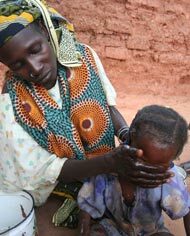 Face washing — with or without soap — helps stop the spread of trachoma. Oumarou and her sister-in-law make soap in their village of Adorihi in southern Niger. The homemade soap resembles charcoal in appearance.